Perfect for heavy-duty applications, a rotary screw air compressor is able to function 24 hours a day without overheating, making it ideal for large warehouses and factories that demand ceaseless performance. A&W Compressor is proud to offer a variety of Atlas Copco rotary screw compressors for sale. Serving Tennessee from Mountain City to Maryville, Cookeville, Nashville, and beyond, we provide affordable and reliable compressors for the entire Volunteer State. 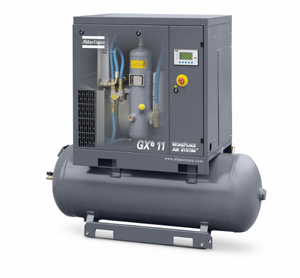 From the SX Series to the complete AIRTOWER package system, A&W Compressor can provide you with your used or refurbished rotary screw air compressor for sale at an affordable price. For more information on getting an air compressor for your business in Knoxville, Johnson City, or any other Tennessee town, call or e-mail A&W Compressor today. We’ll be happy to help you regardless of your location or application.